It was a long time ago, maybe 1983, when we met and became friends. We were both far from home, so friendships were especially appreciated. She was a lot of fun to be with and easy to talk to. As Army wives, we both moved on from that place to go to many other places, but stayed connected the way people did back then, with home addresses. Both of ours changed every 2 to 4 years, but we kept current. It’s been fun to catch up on news through Christmas letters. We have watched each others’ kids grow through the years in pictures and read about the other’s life events. One time, during those years, we found ourselves in their area and had a great visit with them during Sunday morning breakfast. Once they found themselves passing through our area, and we had a nice visit then. She knows of my struggles with MS and she’s aware that Mr. Legs faces physical challenges of his own while helping me with mine. 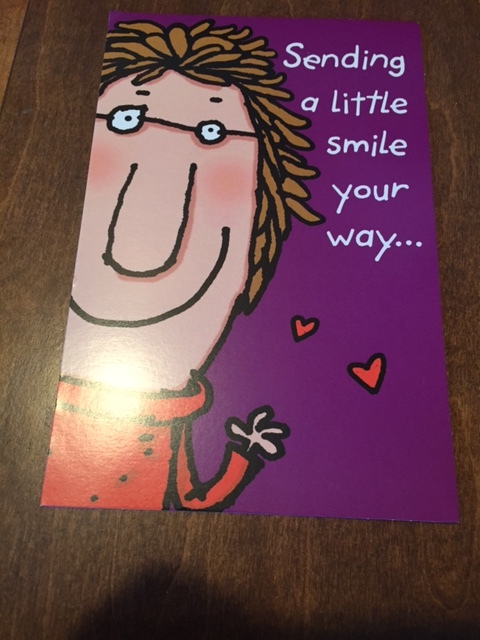 Over a year ago, we started receiving greeting cards from her – the kind that said “thinking of you” or those that had encouraging words. 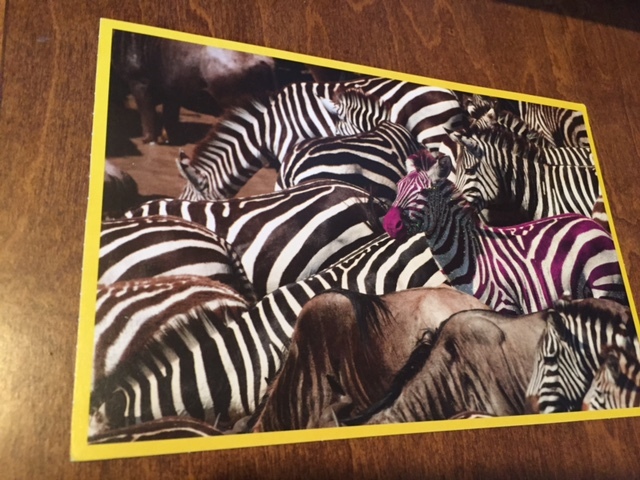 And the cards kept coming…keep coming, once a week. 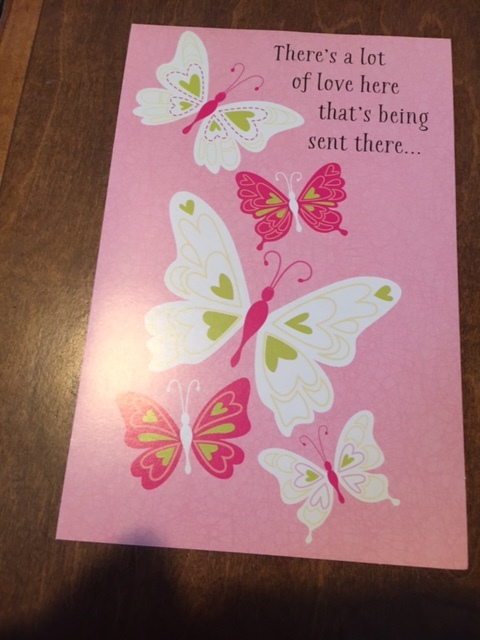 Usually, a card arrives in the mail saying she is praying for us, or with news from their family, or just letting the words of the card speak for itself. 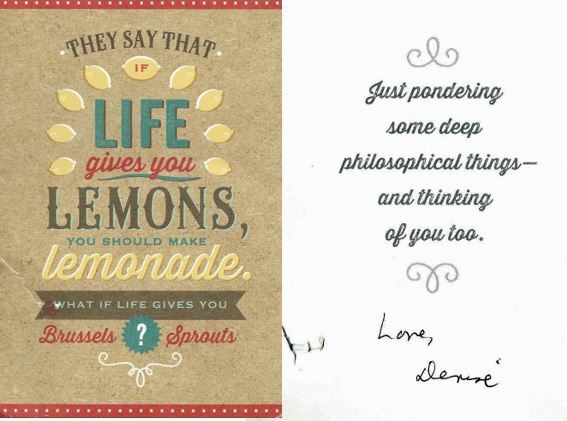 A card might be serious, or funny, touching or thought-provoking. Each one with a unique flavor of caring. 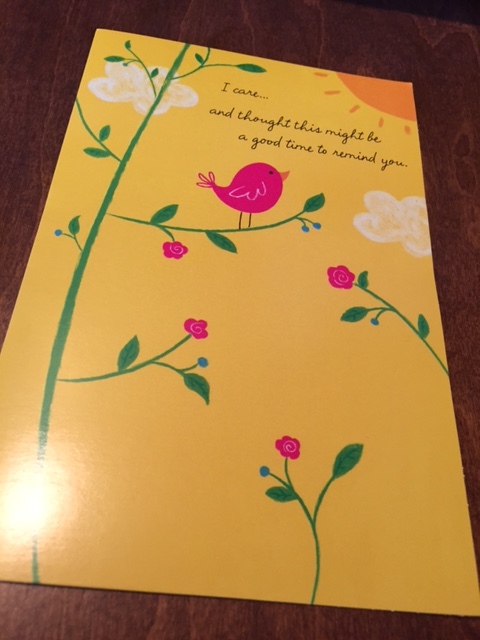 On difficult days, it’s nice to know someone cares. 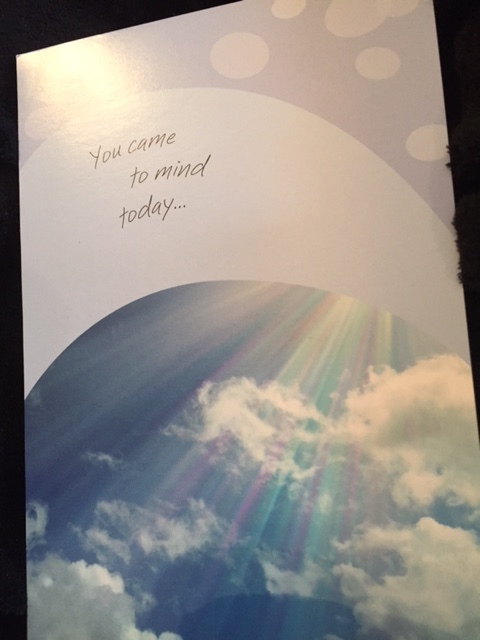 On good days, the cards make things even better. And every day that one arrives, it’s comforting to know someone is praying for us. Many of the cards say flattering things about me or us. What I hope you can see, is how special Denise is. Every time she signs a card, puts it in an envelope, addresses it and sends it off to us, she is being the hands and feet of Jesus. 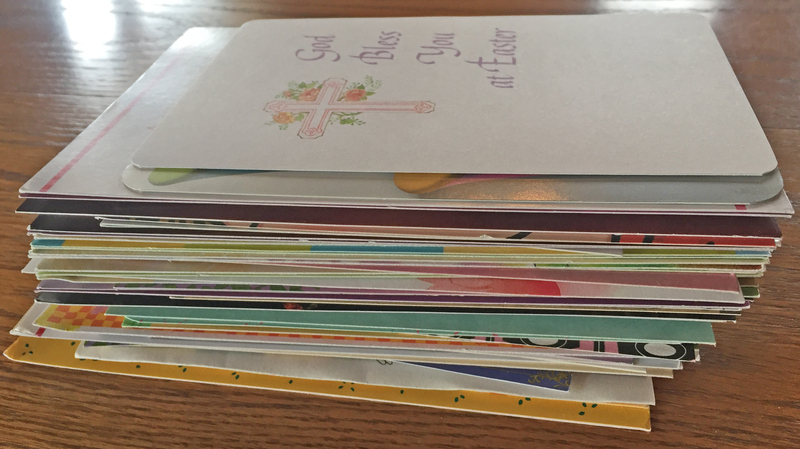 Each card is a message of God’s love from a friend who cares. Denise found a way to show care and concern over the miles between us. She has, over time, sent a beautiful bounty of blessings and made a difference in our lives by reaching out in love. 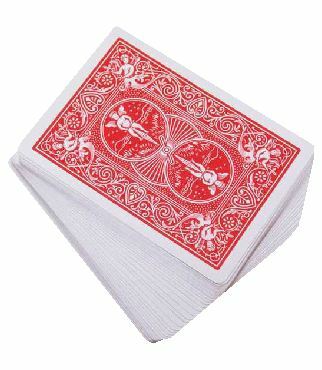 There are 52 cards in a deck. Sometimes our physical challenges feel overwhelming, like we have been dealt a difficult hand to play at this time in the game of life. There are also 52 weeks in a year. 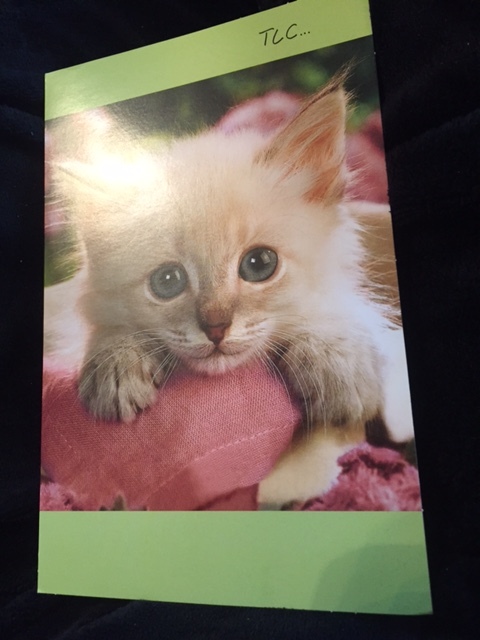 Denise sends a card every week. She places a winning hand of friendship on the table. Her love lightens the load. 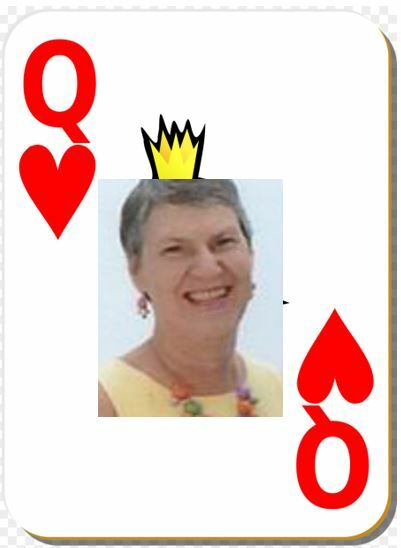 She is the Queen of Cards/Queen of Hearts. 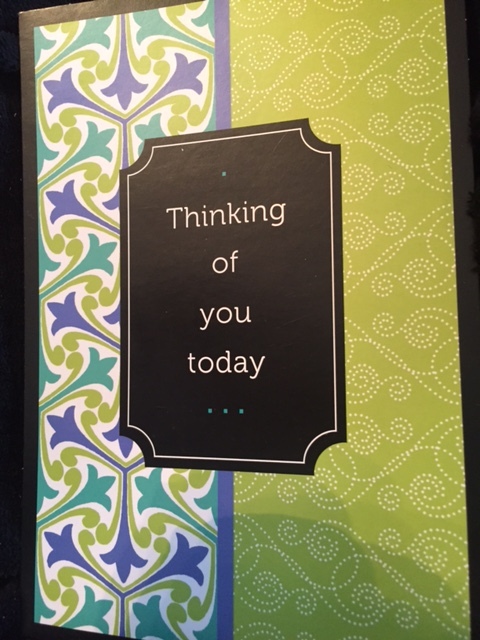 This entry was posted in People Stories and tagged card, cards, caring, deck, Denise, feet, greeting, hands, hearts, Jesus, love, mail, MS, multiple, queen, sclerosis, thoughtful. Bookmark the permalink. As always, thanks so much for sharing your stories, Kerri. 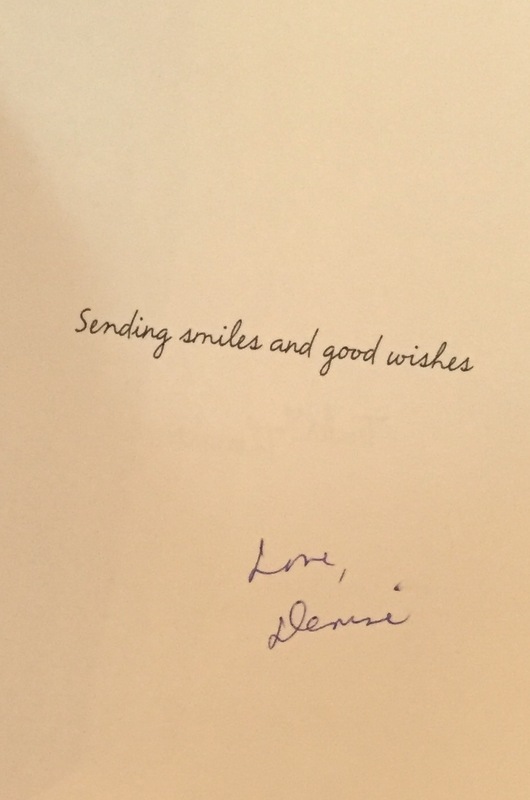 What a wonderful friend you are, Denise. An inspiring story and an impressive display, Mr. Legs! This kind of story is fun to tell. You’re a wonderful friend yourself, JN! Just the nudge I needed today. 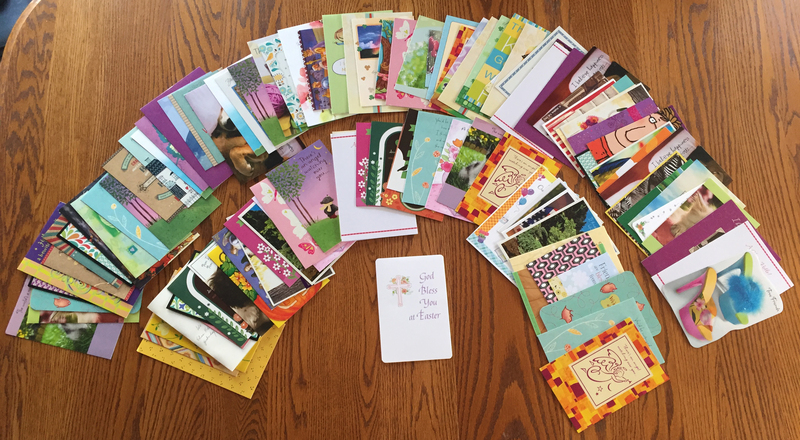 God used you to get me determined to send a card each week to a suffering friend. I WILL follow through. Bless your heart. That’s great – hope it will impact your friend like it has impacted me. Friendship is one of the most valuable things we can have. It is also very rare to have one that has stood the test of time. To have that you are blessed.